Kathleen Reeves was born in Portland, Oregon, baptized a Lutheran, and educated in Portland Public Schools and at Pacific Lutheran University. She describes herself as a "housewife, gardener, lifelong student of History, birdwatcher, orchid-grower and husband-tender". The aforementioned husband is Thomas C. Reeves, PhD, retired professor of history at the University of Wisconsin, Parkside, and author of biographies of John F. Kennedy, Joseph McCarthy, Chester A. Arthur, and most recently, Bishop Fulton Sheen. They have three daughters, two grandchildren and assorted cats and dogs. 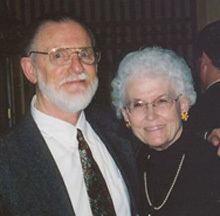 After being atheists for many years, the Reeveses became Episcopalians in the 1970s, and Mrs. Reeves published numerous articles of satire, polemics, book reviews, and "spiritual" writing in various Anglican [Episcopalian] publications. Kathleen retired from the Voices editorial board in 2012.